Asch Harwood is a research associate with the Council on Foreign Relations and the creator of the Nigeria Security Tracker. Previously at UNICEF and Reboot, he is the founder of Red Hook Media Lab. For eight years now, we have been tracking the evolution of political violence in Nigeria with the Nigeria Security Tracker (NST). 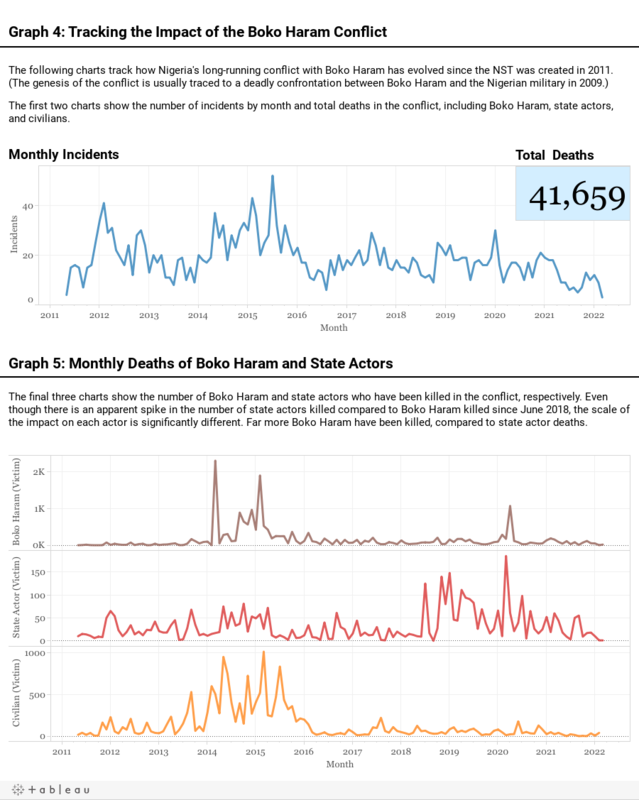 Boko Haram has always been a focus, and in August 2018, we published an analysis of all our Boko Haram data to date. But the NST also collects data pertaining to police and military violence, and sectarian conflict. We have also recorded violent crime and kidnapping. Nevertheless, we are most frequently asked about the conflict in northeastern Nigeria. We have therefore added several new charts to the Nigeria Security Tracker that focus specifically on Boko Haram. The first graph tracks the number of incidents per month involving Boko Haram. These include incidents where Boko Haram is the perpetrator, but also when the military strikes first. An incident is defined as a geographically isolated act of violence that takes place over a continuous period of time. The figure on top right of that graph shows total deaths in the Boko Haram conflict since 2011, when we began the NST. This number includes deaths of Boko Haram members, state actors, and civilians. The final three charts under Graph 5 display our effort to disaggregate the victims of the conflict (as opposed to the total number of deaths by perpetrator, which is displayed in Graphs 2 and 3 of the tracker). On the top is the number of Boko Haram killed, and in the middle is state actors, typically military and police, killed. The bottom is civilians. Based on these charts, we see an increased number of state casualties since July 2018. But note that the scale of the Boko Haram and civilian charts is very different from state actors. Throughout the conflict, far more Boko Haram (or alleged Boko Haram) and civilians have been killed. The Nigeria Security Tracker relies on public reports for its data. This is most useful in tracking changes over time. However, given the limitations of a media-based methodology, it is less useful in declaring definitively the impact of the conflict or the precise number of casualties. We assume a lot goes on that is not reported. Further, particularly in the Boko Haram conflict, there are incentives for the government to downplay the number of state casualties and overstate the number of Boko Haram casualties. Likewise, it is widely believed that the military has targeted civilians while claiming they are Boko Haram. Boko Haram itself has been particularly brutal in its indiscriminate attacks on civilians.